Looking for a delicious peanut butter snack? Look no further! Our NEW Peanut Butter Creme Cakes, cakes are covered in chocolate and have a smooth peanut butter creme filling. A snack cake you are sure to enjoy! XYIENCE Performance Energy Drink – Great tasting, Zero calories, Sugar free, All natural colors and flavors. This innovative mix combines the three essential building blocks for consumers to make a nutritious, delicious smoothie at home: real fruit, a protein boost, and beneficial mix-ins like chia seeds. Each pre-portioned package of thinkThin High Protein Smoothie Mix delivers 15 grams of protein, 5 grams of fiber, real fruit pieces, and 160mg of omega-3 ALA’s from chia seeds and ground flax-seed. Simply tear open a packet, pour into a blender along with almond milk (or another favorite liquid base), ice and blend for an energizing smoothie drink. SunRype’s Fruit & Chia bars are fruit & whole grain bars with gluten free oats, flax & seeds. They are available in two delicious flavor combinations – Apple Cinnamon and Mango Twist. Not only are these bars delicious, they are a good source of vital nutrients like phosphorus, magnesium, fiber and omega-3 fatty acids to help you feel your best every day. With delectable chocolate and coconut, energy bars have never tasted so good. Full of fruit, gluten-free oats, sunflower seeds, flax, and our energetic blend of pea protein, green tea and ginseng. It’s a healthy energy boost for jam-packed days. With delectable chocolate and raspberry, energy bars have never tasted so good. Full of fruit, gluten-free oats, sunflower seeds, flax, and our energetic blend of pea protein, green tea and ginseng. It’s a healthy energy boost for jam-packed days. For parents who are tired of unintentionally giving their kids unhealthy juices filled with addictive artificial sugar and flavors, there’s a new affordable option that is both delicious and nutritious for you and your child. I introduce to you, pūrjus, 100% fruit and vegetable juices that are made in Austria from premium, organic, non-GMO ingredients. Unlike other juices, pūrjus contains no added sugars, artificial colors or preservatives. This will both naturally nourish the body and increase daily fruit and vegetable consumption to maintain a balanced and healthy diet that is crucial for a growing child. Parenting can get expensive! pūrjus is set at an affordable price of $4.99 and is packaged in a 16.9 fl.oz. bottle. It is available in three delicious flavors including apple, beet, and beet apple pear. This Brew Over Ice Pack is great and came in perfect time as we have been having hot and humid weather. My husband loves and I mean loves drinking ice cold tea and trying the Snapple Peach Iced tea from this review was all it took. My husband now has Snapple K-Cups on my grocery list. I liked the vitamin burst strawberry pomegranate brew the flavors really popped in my mouth and tasted great. Our good friend had the Donut Shop sweet & creamy regular iced coffee and said it tasted like what she gets from the drive thru at her favorite restaurant. The plastic tumbler and reusable straw is great as I like having my drinks covered so bugs don't get into my drink. The light up ice bucket is really cool looking and I can't wait to use it at our next cook out or game night when we have a bunch of people over. There is also a Brew Over Ice Instant Win Game and Sweepstakes that I posted about that you can play daily until 9/3/13 for a chance to win. Now for the giveaway: One lucky person will win a Brew Over Ice Prize Pack. This is open to US and ends 8/29/2013 @ 11:59 pm est. To enter, simply do the tasks on the Rafflecopter widget below and you're set to have a chance to win! Remember you can't win if you don't enter. It only takes one entry to win! Disclaimer: I got the Brew Over Ice Items listed above free to do this product Review & Giveaway and was not paid for my response. Please note that SaraLee's Deals Steals & Giveaways are not responsible for sponsors who do not fulfill their prize. TEAS' TEA half&HALF is brewed using the finest green tea leaves and slightly sweetened with only 50 calories per serving. 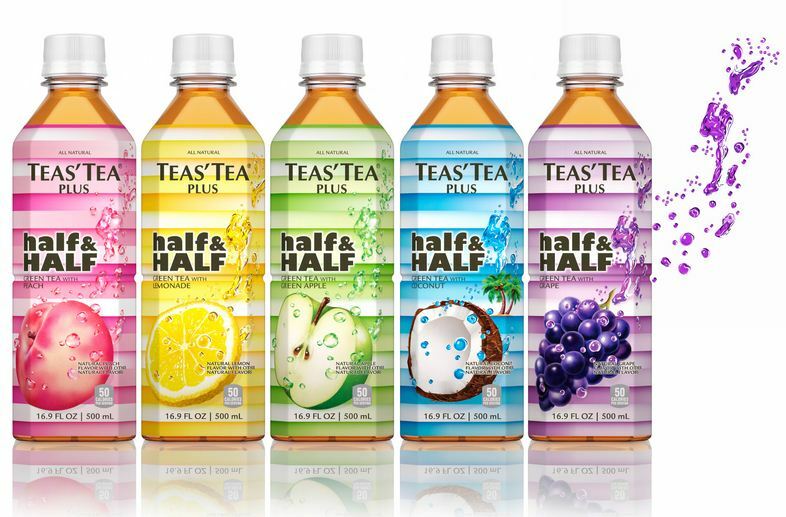 half&HALF comes in 5 delicious flavors – green tea & lemon, green tea & green apple (which came in second place at the North American Tea Championships 2012), green tea & peach, green tea & coconut, green tea & grape. SRP $1.99 per bottle for 16.9 FL OZ (500 ml). 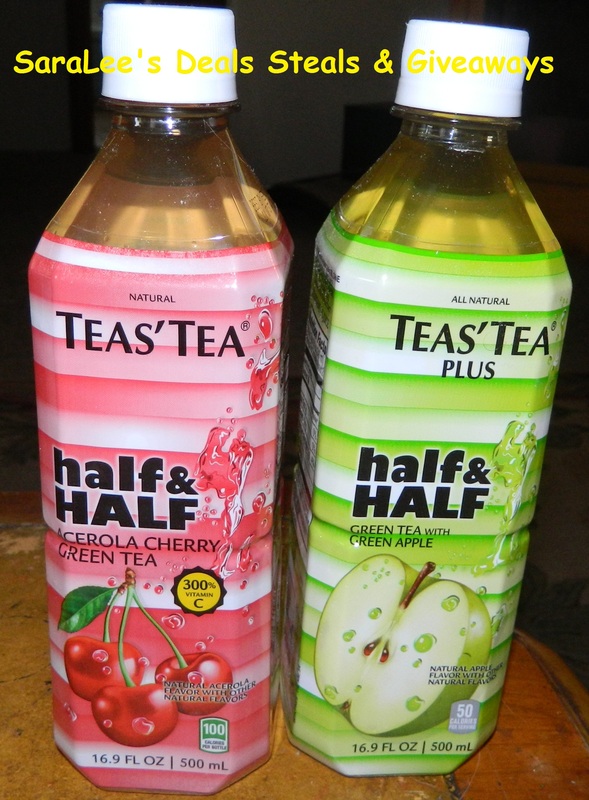 The half&HALF beverage is available at specialty grocery stores, select Whole Foods, Wegmans and online at www.amazon.com and www.teastea.com. After water tea is the most consumed beverage in the world. On any given day, over 160 million Americans are drinking tea. (Source: The Tea Association of the USA). ITO EN pioneered the first bottled green tea in the world. We recommend mixing chilled champagne with a splash of half&HALF green tea lemonade or green apple for a delicious Summer cocktail – perhaps for a wedding shower, ladies night or Summer party entertaining. Pour TEAS' TEA half&HALF into your favorite ice-cube trays to make ice cube shapes of our half&HALF green tea with peach. 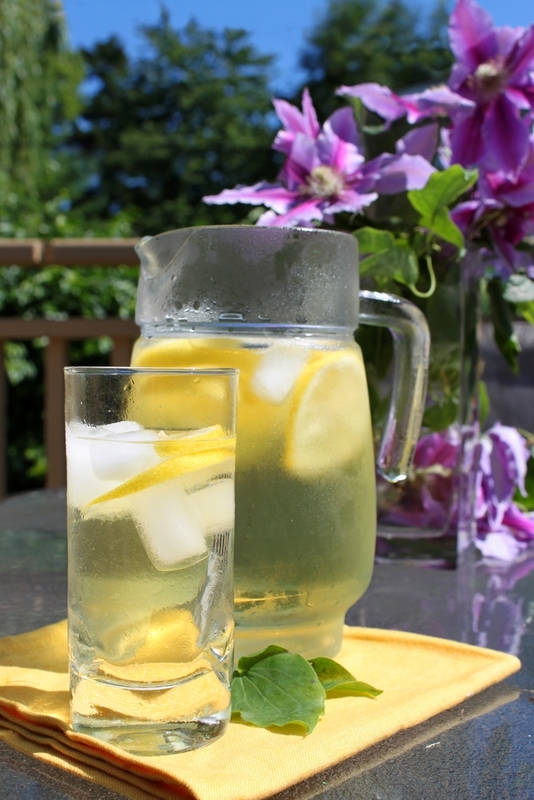 Mix TEAS' TEA half&HALF green tea lemon with Seltzer or Tonic water to give it a fizz. Add slices of lemon for added Summer entertaining. I was able to try the TEAS' TEA half&HALF Acerola Cherry Green Tea and I can say that I like this better than regular tea. The flavor is great and not over powering like others I have had. The tea is only 50 calories per serving. My husband choose to try the TEAS' TEA half&HALF Green Apple Green Tea and he said it was really refreshing and better than drinking a sports drink. My husband works in a factory all day and with the summer heat approaching my husband is always looking for a drink to quench his thirst and that is not going to make him more thirsty. With TEAS' TEA half&HALF my husband feels he is drinking and getting something more than quenching his thirst. 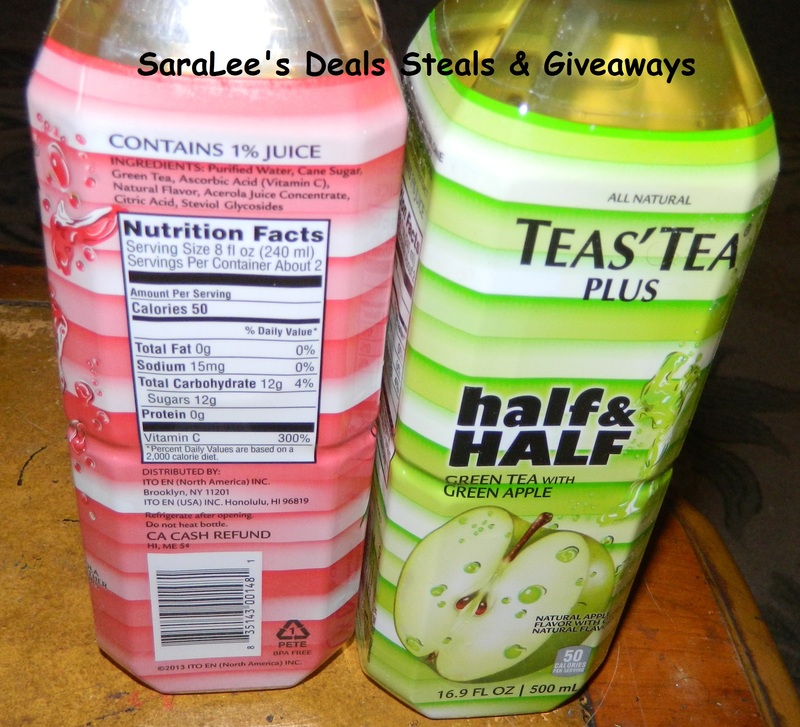 The half&HALF teas were great and I can't wait to get other flavors to try. I can't wait to try the ice cube idea for my next family BBQ. What a great idea for adding and doing something different that most don't think of doing.